The branch of geodesy which utilizes astronomic observations to extract geodetic information. a branch of practical astronomy, closely related to geodesy and cartography. It studies the theory and methods of determining the latitude Φ and the longitude λ of a place as well as the azimuth a of the direction to a terrestrial object and the local sidereal time s from astronomical observations made during geodetic and cartographic work. Since these observations are made in the field, geodetic astronomy is often called field astronomy. The point on the earth’s surface for which the latitude, longitude, and azimuth are determined by astronomical observation is called the astronomical point. Geodetic astronomy consists in the study of (1) portable astronomical instruments, (2) the theory of observation of celestial bodies and methods of determining Φ, λ, a, and s, and (3) the methods of processing the data obtained from astronomical observations. Small, portable astronomical instruments are used in geodetic astronomy; they make it possible to measure the zenith distance and the directions toward celestial bodies and also the horizontal angles between the different directions. The primary instruments used are a theodolite, a field chronometer, and a radio receiver for receiving time signals. A number of methods of astronomical observation have been developed. The method to use depends on what is being determined (time, latitude, longitude, or azimuth), what celestial body is being observed (stars or the sun), and how and what kind of values are being directly measured through observations of the celestial bodies (zenith distance z, altitude h, azimuth a*, and time T of the star’s transit across a given plane). The choice of any of these methods is determined by the particular problem, the accuracy of its solution, the availability of instruments, and other factors. For these calculations, the celestial coordinates of the observed celestial body, that is, its right ascension α and declination δ, are considered known; they are found in astronomical annuals and catalogs of stars. 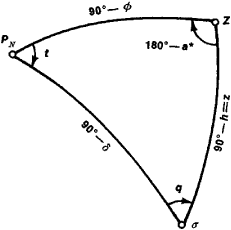 By connecting the pole PN, the zenith of point Z, and the observed celestial object σ on a celestial sphere (see Figure 1) by arcs of great circles, we get the so-called parallactic triangle PNZσ, where the angle of vertex Z is the supplement of the azimuth a* of the celestial object and the angle of vertex PN is equal to the time angle t of the celestial object. Methods based on the measurement of small differences in the zenith distances of northern and southern stars at the meridian by eyepiece micrometers are especially convenient (Talcott’s method). In the methods of corresponding heights, the points T1, and T2 of the passage of two stars across the same almucantar are noted. If Φ is known, then u can be found (Tsinger’s method), and if u is known, then Φ can be determined (Pevtsov’s method). From observations of a series of stars uniformly distributed by azimuth at a fixed altitude of 45° or 30°, Φ and λ can be determined (Mazaev’s method). The azimuth a* of a celestial body is determined by measuring its time angle or zenith distance and finding the latitude Φ of the point of observation. The azimuth a of a terrestrial object is obtained by adding the horizontal angle Q between the star and the terrestrial object to the azimuth of the observed star (usually the North Star). The difference of the longitudes of two points is equal to the difference of the local sidereal times of these points or the difference of the chronometer corrections, referred to one physical moment by a known functioning of clocks, so that λ1- λ2, = s2 - S1 = (T + u2 - (T + u1) = u2 - u1+ T2 - T1. The longitude λ is calculated from the Greenwich meridian. Therefore, λ = s - S = u - U. The chronometer correction u with respect to the local sidereal time s is determined from stellar observation, and U with respect to Greenwich sidereal time S is determined from the reception of rhythmic radio time signals. In modern high-accuracy operations, errors in determining latitude, longitude, and azimuth do not exceed ±0.5”. Tsinger, N. Ia. Kurs prakticheskoi astronomii. Moscow, 1924. Venttsel’, M. K. Polevaia astronomiia, parts 1-2. Moscow, 1938-40. Blazhko, S. N. Kurs prakticheskoi astronomii. Moscow-Leningrad, 1951. Tsvetkov, K. A. Prakticheskaia astronomiia, 2nd ed. Moscow, 1951. Kuznetsov, A. N. Geodezieheskaia astronomiia. Moscow, 1966. Studies on the construction and application of zenith cameras in geodetic astronomy were launched in mid 90's at the Institute of Geodesy and Navigation, University of Federal Armed Forces Munich (Fosu et al. 2006, Status of geodetic astronomy at the beginning of the 21st century. 9(39), Warsaw University of Technology, Institute of Geodesy and Geodetic Astronomy. The observations were leaded by team from Institute of Geodesy and Geodetic Astronomy (Warsaw University of Technology). 6(24), Institut of Geodesy and Geodetic Astronomy, Wars. 2(57), 2001, Warsaw University of Technology, Institute of Geodesy and Geodetic Astronomy, pp. 2001, Possibilities of improving the velocity estimates from CERGOP Campaigns, Reports on Geodesy, No 2,(57), Warsaw University of Technology, Institute of Geodesy and Geodetic Astronomy, pp. Reports on Geodesy Nr 1 (64), Warsaw University of Technology, Institute of Geodesy and Geodetic Astronomy, 93-102. The studies were executed by the staff of the Institute of Geodesy and Geodetic Astronomy, Warsaw University of Technology. The monitoring of the Earth's gravitational field changes in Poland has been conducted since late 1970s by the Institute of Geodesy and Geodetic Astronomy of the Warsaw University of Technology. In order to take readings of the LC&R gravimeter the interpolation method developed in the Institute of Geodesy and Geodetic Astronomy was applied, which guaranteed reading precision at a level of 1 [micro]Gal (Pachuta, 1998).